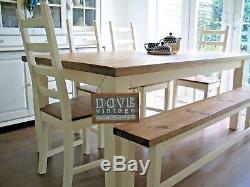 Y ou are viewing a Dove Vintage Chunky Solid Pine Table, Four Chairs and Bench. 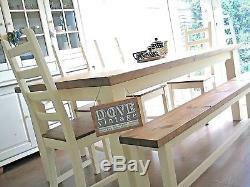 The beautiful solid cream frame contrasts the time worn timber of the table top, bench & seats. We're so delighted & Rob couldn't have been more helpful!!! 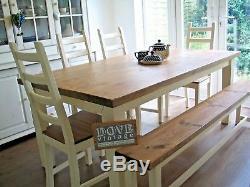 Absolutely stunning table and chairs, great communication and service, so happy! Beautiful, well made table set. Very helpful people, ex comms. Looking forward to doing business again. Ebayer that goes over and above! Fantastic piece of furniture, highly recommended. Y ou are free to collect or arrange your own courier. Please feel free to view, we are in the Midlands (Rolleston on Dove, DE13). 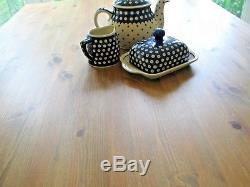 Lovely solid pine table top very solid & very heavy! 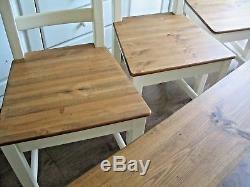 , which has been re-sanded, stained and has a nice silky finish (3 coats matt varnish). The top has a worn look and has a few minor marks etc. But this adds to the feel of the piece. The chunky legs and frame have been hand painted with two coats of undercoat and then three coats of Laura Ashley "Pale Linen" Eggshell, for a lovely soft sheen. 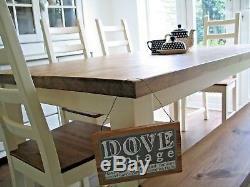 Table dimensions; Length 180cm (71"), Height 77cm (30"), Width 100cm (39). The legs can be removed from the table top. We also supply a small tub of the original paint to allow you touch up any future marks etc. 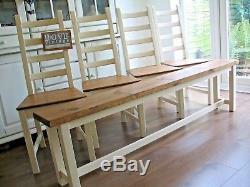 The bench is hand made with a reclaimed seat to match the table top. 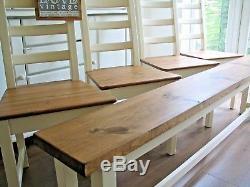 Bench dimensions: Length 180cm (71"), Width 22cm (8.5"), Height 48cm (19). Fo ur very solid "ladder-back" style chairs, with beautiful pine seats which has been re-sanded, stained and has a nice silky finish (3 coats matt varnish). The frames have been hand painted with undercoat and then three coats of Laura Ashley "Pale Linen" Eggshell for a lovely soft sheen. The chairs have a few minor bumps and knocks, but adds to the feel of this piece. I try and describe my items as clearly and honestly as possible and please note that these items are hand-painted. I also use reclaimed pine boards, so they have imperfections and are not perfectly straight, so please bear this in mind. Please see my 100% feedback to ensure you get a quality item. The item "Country Chunky Pine Farmhouse Dining Table 8 Seater 4 Chairs & Bench Shabby Chic" is in sale since Monday, July 2, 2018. 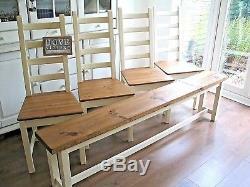 This item is in the category "Home, Furniture & DIY\Furniture\Table & Chair Sets". 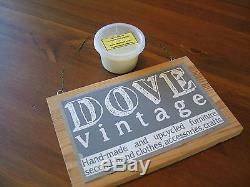 The seller is "dovevintage" and is located in Burton-on-Trent. This item can be shipped to United Kingdom.